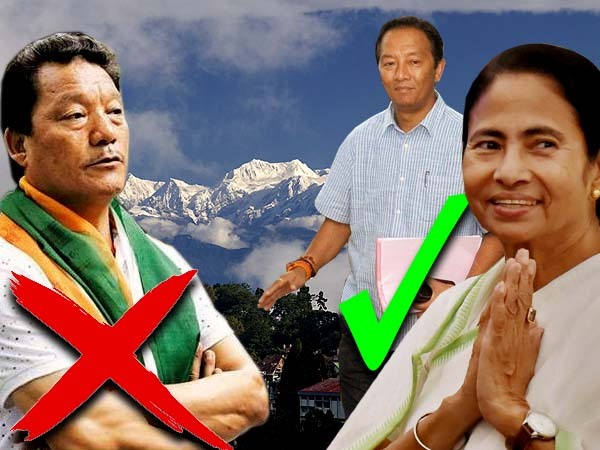 The Gorkha Janmukti Morcha has “officially” announced its decision to end its decade-old association with the BJP-led NDA, which could affect the poll arithmetic in at least four Lok Sabha seats in north Bengal. Among them is the prestigious Darjeeling seat, which has provided the BJP with a toehold in the region since 2009, and which no party can hope to win without the Morcha’s endorsement. Morcha president Binay Tamang has handed over a letter to chief minister Mamata Banerjee informing her of the decision and expressing willingness to join a “third party” alliance. Tamang, along with Morcha general secretary Anit Thapa, had attended the Opposition rally at the Brigade on Saturday. “The Gorkha Janmukti Morcha, an alliance party to the NDA for the last 10 years, would like to officially communicate to the chief convener of the third party alliance that we are officially declaring that we are going to pull out from the NDA alliance (and) is ready to join the third party alliance in the centre in the upcoming 2019 elections,” Tamang’s letter said. With the change in Morcha leadership, it was more or less expected that Tamang would be distancing himself from the NDA. “Apart from remaining silent during the last agitation, the BJP has not yet fulfilled any of the demands of the hill people,” said a source. The Morcha wants the “third front” to grant land rights to tea garden and cinchona plantation workers. Even though tea and cinchona garden workers have been living in the plantations for over a century, they do not have any land rights (patta). “If Mamata Banerjee takes up the land rights issue with a positive assurance, the anti-BJP front will get a head start not just in Darjeeling but also in Alipurduar, Jalpaiguri and Raiganj,” said an observer. The other Morcha demands include tribal status for 11 communities, linguistic minority status for the Nepali language and ensuring that the Gorkhaland Territorial Administration can access benefits from the Union ministry of development of northeastern region (Doner).